7FJ, Fernow, and a piece of the Entiat glacier from Maude. The Washington Cascades contain many worthy peaks, mostly with long approaches starting at low elevations, and long drives between. 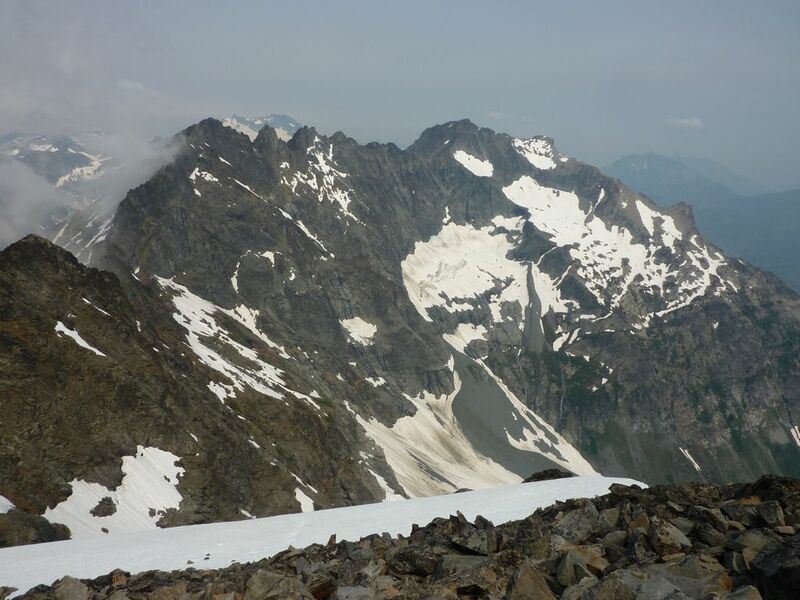 The climbing varies from good solid ridges, to endless choss, to glaciers and snow. It being wet and green here, the rock is rounded and often covered in lichen, and takes some getting used to for someone used to Sierra granite and the clean rock of the desert southwest. Ptarmigan, 10 seconds before attack. The Cascades also have vicious ptarmigans: on a hike, I surprised a ptarmigan hen with at least one chick. 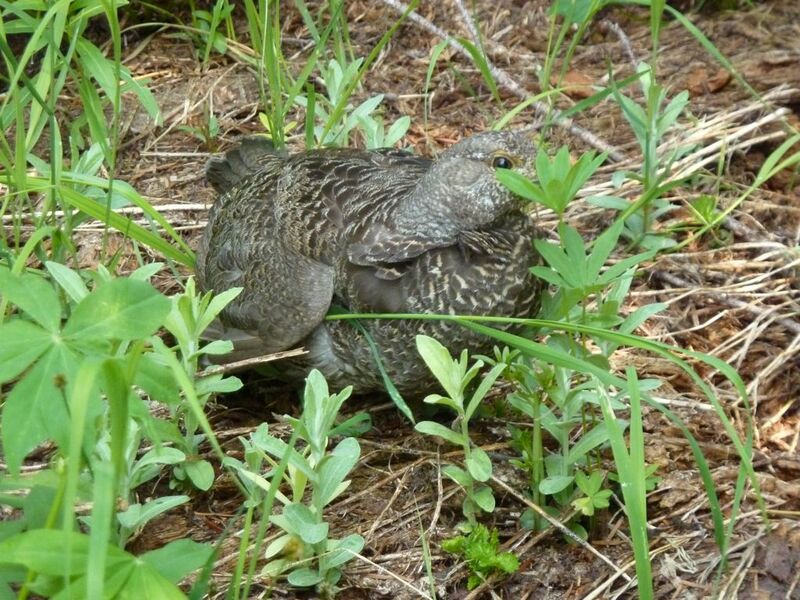 During a similar incident in Glacier NP, the female (mistakenly identified as a pheasant) clucked at me while the chicks flew or scuttled a short distance away. This time, the chick seemed too small to fly, and the mother, after putting itself in front of her, stared at me and clucked. I went on, assuming she would move and let me by, but instead she stood up, ruffled her neck, and hissed. Somewhat taken aback, I tried to make my way around to one side, at which point she hissed again and bluff-charged me, leading with beak and talons. I swore in the future to avoid mother animals with a chance of actually hurting me. The three high Chiwawa peaks, Fernow, Maude, and Seven Fingered Jack, are deep in the middle of nowhere: the trailhead (at ~3500ft) is 47 miles from the nearest town, 23 miles down a hard-to-find Forest Service access road. Several years ago, a friend and I tried to climb them all in a day, leaving Redmond at 3 AM. After finally finding the road and navigating his low-clearance sedan down the long dirt section, we started later than expected, ended up climbing only Jack, and suffered mightily on the 24 hour house-to-house adventure. I have no idea how I convinced my friend to do this. The record for climbing all three peaks is an utterly superhuman 11h13. While I’m nowhere near challenging that, I thought I would try to bag Fernow and Maude in a day. It had rained heavily the afternoon before, and I was nearly turned around at a deep mudslide across the road, which trapped a number of people in passenger cars on the trailhead side, with no facilities, 20 miles from town. I got an early enough start, but paranoia about missing the turnoff to Spider Meadows cost me some time wandering around on game paths. It turns out that either I misremembered, or they have added an obvious sign in the last few years. Once on the trail, I charged uphill, making good time to the meadow, and maintaining a decent pace up the trail toward 7FJ and Maude, the heavy morning dew thoroughly soaking my shoes and pants. I encountered a large group of unfortunate campers drying out after the previous day’s vicious rain and lightning. I left the trail at the meadow, heading as directly as possible for the saddle to Fernow. I dodged some steep rock and waterfalls to the left on steep grass, then steep scree and treacherous mud, and eventually got to the permanent snowfield below the pass. I felt slow, but forced myself to reach the saddle at 7800 feet before stopping for a snack. The chute on the other side of the saddle, dry when I last saw it, still contained about 8 feet of hard snow, and I kicked myself for not bringing crampons. After a bit of exploring, I found a way to bypass the chute to the right, leading to loose ground and outward-sloping slabs down to the glacier. At this point my soaking feet and I were very cold, Fernow looked far away, and I suddenly found many good reasons not to climb it. After sitting at the pass for awhile, curled up behind a rock, wearing everything I had, I decided “screw it” and headed for Maude. I followed the same loose gully that had defeated me last time — this time filled with snow that I had to bypass by edging along one wall. With stronger climbing skills and a bit of searching, I was able to find a way out of the gullies onto the gentler face. I suppose this part was “class 3” like I had read, if you don’t mind climbing a moss-covered pile of rocks, many of the large ones held in place only by mud. The rest of the face/slope was cleaner mixed class 2 and 3, and after much suffering in the heat, and a wrong turn along the ridge, I finally reached the rounded summit. One other party had been there earlier in the day, on some kind of memorial climb for a friend killed on Rainier. The return trip was long and hot, and I was glad to be a day-hiker as I passed a couple large groups of children carrying all kinds of camping gear. I’m not sure where they planned to camp, or what to do — they didn’t seem like the mountain-climbing type. Typical loose climbing higher up on Maude. Maude’s rounded summit, from nearby ridge pinnacles.